Recently, at the CLEI Center for Keratoconus we have started offering an innovative new treatment for keratoconus: topography-guided PRK (photorefractive keratectomy) combined with corneal crosslinking. Topography-guided PRK (TG-PRK) is a laser procedure which may improve visual function in select KC patients. PRK (photorefractive keratectomy) is similar to LASIK, which is used to correct nearsightedness and astigmatism. In keratoconus, however, the laser is used to reduce corneal optical irregularities. TG-PRK achieves this by incorporating your individual corneal topography map into the laser treatment. By utilizing your custom corneal topography data, the laser reshapes your corneal surface to improve your corneal optical architecture and visual performance. The goal is to improve the corneal shape in order to improve visual quality with glasses or contact lens fit depending on your problem. Some patients may also note general improvement in visual function. The individual cornea map from your eye is used to help program the laser to guide treatment to your particular optical problem. In some cases, adjunctive procedures on patients who have had CXL and TG- PRK can be performed with encouraging results. In this patient, note the significant keratoconus as seen in the red area (the elevated area on the map on the upper right. Collagen crosslinking led to stabilization of the cornea, but there are still significant distortion because, although CXL strengthens the cornea, it does not change its shape dramatically. This patient then underwent topography guided PRK. In the lower left map, you can seen how the high red area has decreased in size. 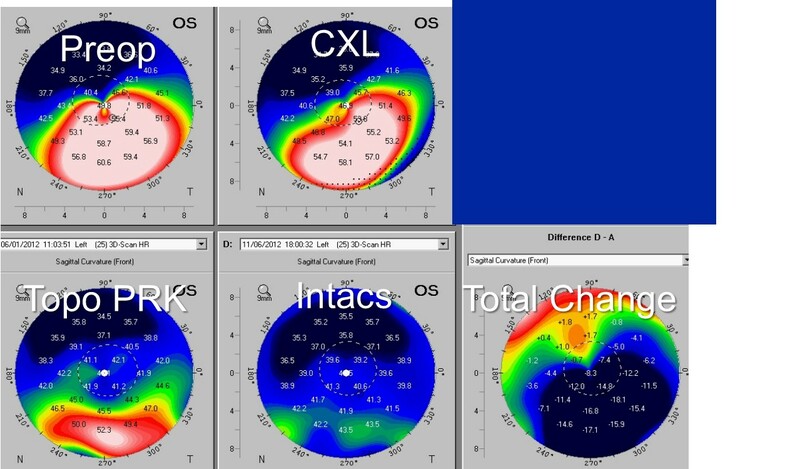 Intacs were then placed under the remaining elevated area with much improved corneal symmetry (note how the entire cornea has a consistent blue, non-elevated, color). The map on the bottom right is a difference map. The keratoconic bulge on the bottom has flattend substantially, by 17 diopters in height, whereas the top of the cornea has steepened somewhat, as desired to make the cornea as smooth, optically, a possible. So, for the patient with keratoconus, it is important to know that, although KC is a chronic disease, a stepwise treatment plan can get you the best long-term vision. Although, not all procedures are for everyone, a tailored approach over time may combine a variety of procedures to optimize your corneal shape and visual outcome. Current results have been quite promising. 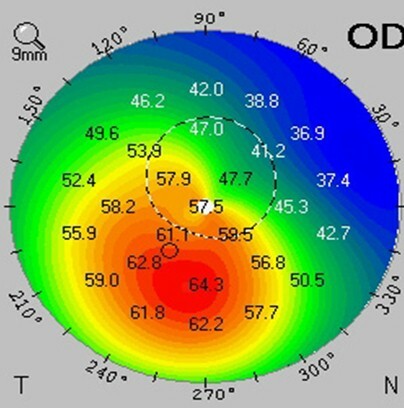 If you are interested in an evaluation to see if topography-guided PRK combind with CXL is right for you, contact our office at 201-692-9434 to schedule a full keratoconus evaluation with Dr. Peter Hersh.